注1）Ozeki T, Mushiroda T, Yowang A, et al. 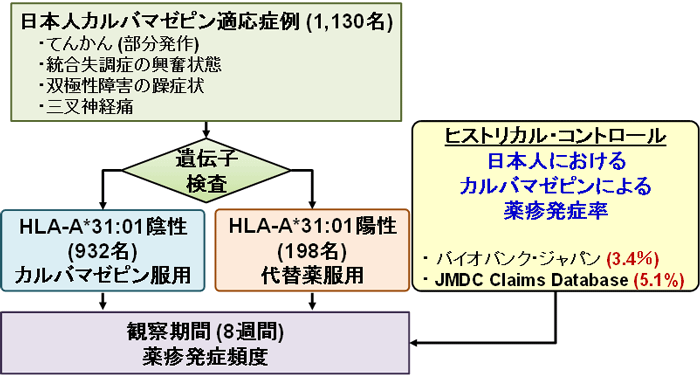 Genome-wide association study identifies HLA-A*3101 allele as a genetic risk factor for carbamazepine-induced cutaneous adverse drug reactions in Japanese population. Hum Mol Genet 2011;20(5):1034-1041. 注2）Kramlinger KG, Phillips KA, Post RM. Rash complicating carbamazepine treatment. J Clin Psychopharmacol 1994;14(6):408-413; Arif H, Buchsbaum R, Weintraub D, et al. Comparison and predictors of rash associated with 15 antiepileptic drugs. Neurology2007;68(2):1701-1709; McCormack M, Alfirevic A, Bourgeois S, et al. HLA-A*31:01 and carbamazepine-induced hypersensitivity reactions in Europeans. N Engl J Med 2011;364(12):1134-1143; Shirzadi M, Alvestad S, Hovdal H, et al. Comparison of carbamazepine rash in multiple sclerosis and epilepsy. Acta Neurol Scand 2012;125(1):60-63.